Get cloud level and meander along the ridge lines of an ancient mountain ridge. Look down on the valleys below, some farm fields, some deep woods and others dotted with farms, houses and churches. 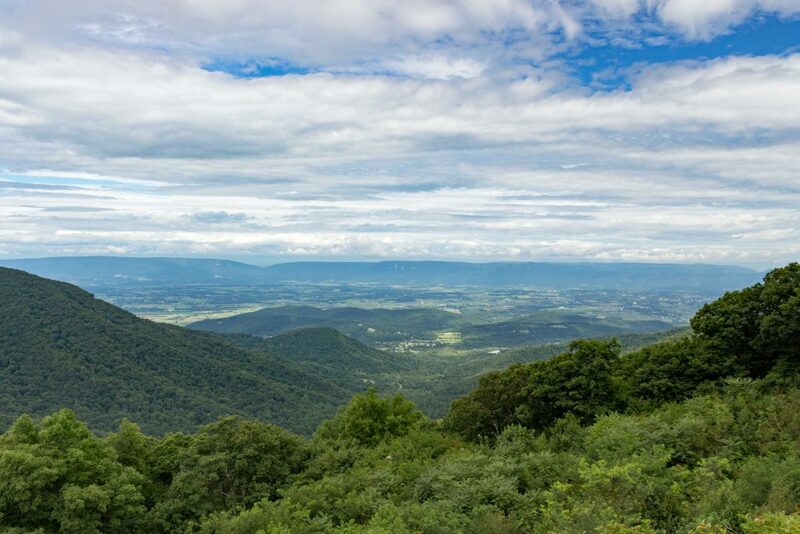 This is the Shenandoah Valley, revered in folk country songs for its beauty and wholesome American values. And you’re on Skyline Drive. To take the drive from the tippy top to the very bottom, you’ll want to leave at least a full day. Preferably, start your journey in the early morning while there is still dew on the ground. From the Ranger’s Station entrance, you’ll gradually climb higher until you follow a fairly steady ridge for the duration. Keep it slow (the speed limit is 35 for a reason) so you don’t miss the scenic turnoffs, trail heads or way stations. Open your windows, too, so you can hear the tree frogs, crickets and birds as you motor along. You won’t want to miss the way stations, of this you can be assured. Why? Restroom breaks are a biggie. But more than that, you will want to get one—or two—blackberry milkshakes. These are famous among the Appalachian Trail hikers who frequently espouse the virtues of the Shenandoah National Park’s elevation (relatively low on ups and downs) as well as wildflowers, views and amenities. The way stations, which offer hot dog and hamburger joints and milkshakes, are scattered along the Skyline Drive so you can be assured you won’t A.) Go hungry, or B.) Have to go potty in the woods. The National Park centers are also found periodically along the Skyline Drive and offer clean restrooms, gift shops, at least one bona fide restaurant. All are handicap accessible. 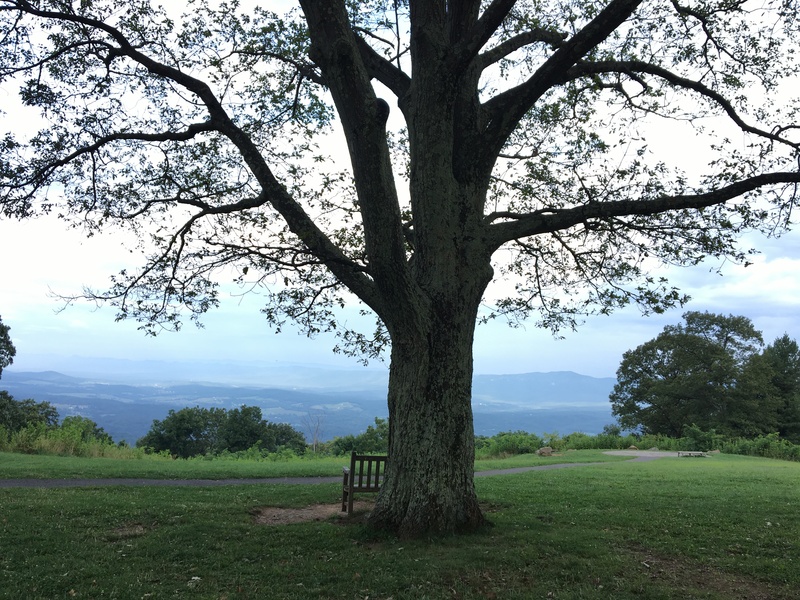 Shenandoah is also the perfect park to take in a picnic lunch as you’ll be able to get a table with a mountaintop view. This is a drive that’s full of scenic splendors, hiking opportunities, decadent flavors, and can be done by anyone. If you want a taste of the great outdoors, without having to leave the comfort of your car, or have limited mobility, this is it. Just make sure to reach the other end by sunset so you can get some great mountain-valley shots as the peaches, purples and reds set in. Tagged Appalachian Trail, blackberry shakes, hikers, hiking, mountains, National Park Service, nature, Shenandoah valley, Skyline Drive, Virginia. Bookmark the permalink. You are making me hungry for a blackberry shake. LOL! Question. Do you happen to know if they allow metal detecting along the Appalachian Trail? We will be heading there this fall and can’t decide whether or not to pack our treasure-finding gear or not. If not there, are there other good spots in the area? Thanks in advance for your input. Tim. That’s a good question, Tim. Any federal land (i.e. the national park… and the trail is a scenic national trail) is off limits to metal detecting. However, you can certainly ask officials everywhere you go if you can metal detect alongside the trail (not necessarily on the path itself) when it’s going through private or state property. The rules change a bit for state property, but it’s best to ask for permission. Also, always plan to practice ‘leave no trace’ in that you should cover your holes and seek to not disturb nature much. Happy hunting, Tim!